Summary: Use this Test Lab Guide to create an Office 365 trial subscription for evaluation or dev/test. The lightweight Office 365 dev/test environment consists of an Office 365 trial subscription that you access from your main computer. Use this environment when you want to quickly demonstrate a feature. For the lightweight Office 365 dev/test environment, complete only phases 2 and 3 of this article. The simulated enterprise Office 365 dev/test environment consists of an Office 365 trial subscription and a simplified organization intranet connected to the Internet, which is hosted in Microsoft Azure infrastructure services. You can build this configuration completely in the Microsoft cloud. Use this environment when you want to demonstrate a feature or an app in an environment that resembles a typical organization network connected to the Internet, or for features that require this type of environment. For the simulated enterprise Office 365 dev/test environment, complete phases 1, 2, and 3 of this article. You might want to print this article to record the specific values that you will need for this environment over the 30 days of the Office 365 trial subscription. You can easily extend the trail subscription for another 30 days. For a permanent dev/test environment, create a new paid subscription with a small number of licenses. Click here for a visual map to all the articles in the Office 365 Test Lab Guide stack. Follow the instructions in Base Configuration dev/test environment. You will need an Azure subscription. You can use the Azure Free Trial for this configuration. If you have an MSDN or Visual Studio subscription, see Monthly Azure credit for Visual Studio subscribers. 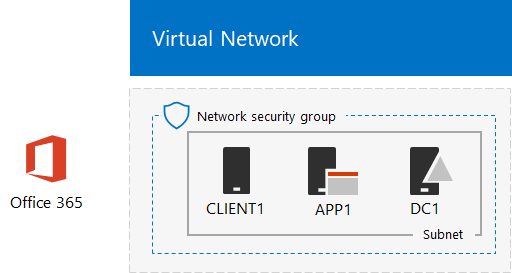 This configuration consists of the DC1, APP1, and CLIENT1 virtual machines on a subnet of an Azure virtual network. To start your Office 365 E5 trial subscription, you first need a fictitious company name and a new Microsoft account. To sign up for a new Microsoft account, go to https://outlook.com and create an account with a new email account and address. You will use this account to sign up for Office 365. For the lightweight Office 365 dev/test environment, open the Internet browser on your computer and go to https://aka.ms/e5trial. For the simulated enterprise Office 365 dev/test environment, connect to CLIENT1 with the CORP\User1 account from the Azure portal. From the Start screen, run Microsoft Edge and go to https://aka.ms/e5trial. Click Just one more step. On the Create your user ID page, type a user name based on your new email address, your fictional company after the @ sign (remove all spaces in the name), then a password (twice) for this new Office 365 account. Record the password that you typed in a secure location. On the Prove. You're. Not. A. Robot. page, type the phone number of your text-capable phone, and then click Text me. Type the verification code from the received text message, and then click Next. This value will be referred to as the Office 365 global administrator name. When you see You're ready to go, click it. On the next page, wait until Office 365 completes setting up and all the tiles are available. You should see main Office 365 portal page from which you can access Office Online services and the Microsoft 365 Admin center. For the simulated enterprise Office 365 dev/test environment, here is your resulting configuration. 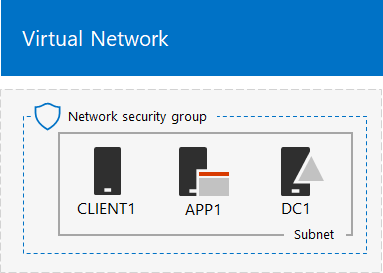 The DC1, APP1, and CLIENT1 virtual machines on a subnet of an Azure virtual network. An Office 365 E5 Trial Subscription. In this phase, you configure your Office 365 subscription with additional users and assign them Office 365 E5 licenses. Your computer (for the lightweight Office 365 dev/test environment). The CLIENT1 virtual machine (for the simulated enterprise Office 365 dev/test environment). In the Windows PowerShell Credential Request dialog box, type the Office 365 global administrator name (example: jdoe@contosotoycompany.onmicrosoft.com) and password. $loc="<two-character country code, such as US>"
$userUPN= "user2@" + $orgName + ".onmicrosoft.com"
New-AzureADUser -DisplayName "User 2" -GivenName User -SurName 2 -UserPrincipalName $userUPN -UsageLocation $loc -AccountEnabled $true -PasswordProfile $PasswordProfile -MailNickName "user2"
$userUPN= "user3@" + $orgName + ".onmicrosoft.com"
New-AzureADUser -DisplayName "User 3" -GivenName User -SurName 3 -UserPrincipalName $userUPN -UsageLocation $loc -AccountEnabled $true -PasswordProfile $PasswordProfile -MailNickName "user3"
$userUPN= "user4@" + $orgName + ".onmicrosoft.com"
New-AzureADUser -DisplayName "User 4" -GivenName User -SurName 4 -UserPrincipalName $userUPN -UsageLocation $loc -AccountEnabled $true -PasswordProfile $PasswordProfile -MailNickName "user4"
In this phase, you configure a set of SharePoint Online team sites. Install the SharePoint Online Management Shell (the x64 version). Click Start, type sharepoint, and then click SharePoint Online Management Shell. $spURL="https://" + $orgName + "-admin.sharepoint.com"
In the Microsoft SharePoint Online Management Shell dialog box, type the Office 365 global administrator name (example: jdoe@contosotoycompany.onmicrosoft.com) and password, and then click Sign in. $owner = "<global administrator account name>"
$siteURL = "https://" + $orgName + ".sharepoint.com/sites/sales"
New-SPOSite -Url $siteURL -Owner $owner -StorageQuota 1000 -Title "Sales site collection" -Template "STS#0"
$siteURL = "https://" + $orgName + ".sharepoint.com/sites/production"
New-SPOSite -Url $siteURL -Owner $owner -StorageQuota 1000 -Title "Production site collection" -Template "STS#0"
$siteURL = "https://" + $orgName + ".sharepoint.com/sites/support"
New-SPOSite -Url $siteURL -Owner $owner -StorageQuota 1000 -Title "Support site collection" -Template "STS#0"
In Internet Explorer, enter the URL of the Production site to see the default SharePoint Online team site for the Production department. Also record the password for this account in a secure location. Also record the passwords for these accounts in a secure location.